MME papers used are from Love Me, Lost & Found/Union Square and Madison Avenue. 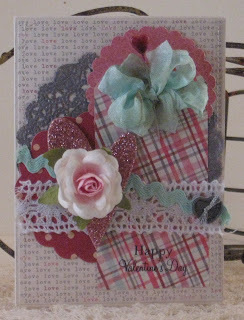 Chipboard heart from Melissa Frances, decorative pin from Maya Road, paper doily altered using GlimmerMist, paper flower from Prima, stamped sentiment from PTI, misc. seam binding ribbon, crocheted trim, ric rac and metal embellishment. Cathy I;ve been away for so long and I have to catch up. I have been blogging on and off and in one or the other way I missed your posts. But this is such a lovely way to start. The mix of patterned papers and I LOVE that grey doily. Your cards are always elegant and i never ever get tired of it! Stay inside andwarm; have a lovely Sunday!